Who is at Fault When a Commercial Truck Hits a Car in California? Who is at fault when a commercial truck hits a car in California? Commercial truck versus passenger vehicle collisions are among the most devastating types of accidents. These accidents are also highly complex, making the determination of fault difficult. In these crashes, there are multiple parties who can share fault. An experienced Los Angeles personal injury attorney may analyze the evidence to determine all of the parties that potentially are to blame for the accident so that the correct parties can be named as defendants. As you can see, these causes can be divided into vehicular causes, environmental causes and driver causes, meaning that multiple parties may have some fault. Parties that are responsible for the maintenance and repair of brakes, tires and other truck parts may be liable for an accident. Under California law, trucking companies owe a duty of care to maintain safe trucks and buses. They must also have regular inspections and compliance checks. Companies that fail to maintain the trucks and buses in a safe manner or to submit to inspections and compliance checks may be liable to pay damages when accidents result. Under Cal. Veh. Code § 22350, drivers in the state are not supposed to drive faster than the conditions allow, including the weather, traffic, visibility and other factors. This is very important for large trucks because of the long stopping distances that they require. Large trucks are simply unable to come to abrupt stops. One common type of truck accident that can happen when truck drivers are driving too fast for conditions is a jackknifing accident. This happens when a large truck tries to brake suddenly when the truck is approaching a spot that is slick, causing the wheels to lock. The trailer continues to move forward, and the driver loses control with the trailer swinging out to the side. Truck drivers drive for long hours each day. The federal government has hours-of-service rules in place to limit the number of hours that the drivers can drive each day and each week as well as the number of hours that they must have off from work. Driver fatigue factors into many collisions involving large trucks. As we have previously noted, the National Transportation Safety Board estimates that between 30 and 40 percent of commercial truck crashes involve drivers who are fatigued. Drivers may drive for more than their allowed hours because of feeling pressured by their trucking carriers. They might also be expected to reach a delivery destination in a shorter amount of time than what is possible given the hours that they are allowed to drive along with the speed limits. This might lead the drivers to drive when they are tired and fail to pull off of the road in order to rest. Some drivers cause accidents while they are under the influence of alcohol or drugs. Truck drivers must submit to regular alcohol and drug tests, but driving under the influence happens more often than people might believe. In addition to illegal drugs and alcohol, some drivers have accidents when they are under the influence of prescription drugs or over-the-counter medications. As we have noted before, plaintiffs may recover treble damages from the drivers’ employers if the drivers were under the influence of alcohol or drugs and the employers failed to test them as required by the law. This broad category of driver-related factors includes many things. Some of the most common types include trying to enter freeways or other roads without having enough room to do so. Miscalculations of speed and the distance of oncoming traffic are also common. Cal. Veh. Code § 21804 mandates that drivers that are about to enter or cross a roadway yield to oncoming traffic that is close enough to create a hazard. Unsafe lane changes are also a common illegal maneuver that can result in truck collisions. These are prohibited under Cal. Veh. Code § 22107, which requires all drivers to only change lanes when it is safe to do so and to use signals to let other drivers know. Truck drivers may be distracted by things outside of the truck as well as by things inside of their cabs. As we have previously explained, drivers are prohibited from using handheld mobile phones or texting while driving. In addition to cell phones, drivers may be distracted by billboards, other drivers, buildings and other objects outside. They may also be distracted by their dispatch equipment and other electronics inside of their cabs. When truck drivers are distracted, they may fail to see that traffic has slowed ahead of them and crash into the rears of other vehicles. They may also drift into other lanes, colliding with passenger vehicles that are present. Many catastrophic commercial truck accidents happen because the truck drivers are driving too close to other vehicles. As we have discussed, trucks require much greater stopping distances than do other vehicles. When they drive too closely behind other cars that suddenly slow down, the truck drivers may be unable to stop and collide with the vehicles in rear-end collisions. Parties that load the trucks such as shippers and distributors must load the cargo safely and make certain that it is properly secured. When the trucks are not loaded properly, or the loads are improperly secured, they may shift. Sudden shifts of the cargo may cause the truck drivers to lose control of the trucks or cause them to overturn. Improperly secured loads may fall off of the trucks into the paths of other cars. If you are struck by a large truck, there are several things that you should do. Get the driver’s license and insurance information as well as the information about the company for whom the driver was driving at the time of the accident. This should include the company’s name, address and phone number. Do not accept blame for the accident or deny that you have been injured at the scene of the accident. Many people do not realize that they have been injured in the immediate aftermath of a crash because of the surge of adrenaline that they experience. You should seek prompt medical attention or ask for medical transport from the scene by an ambulance. It is important that you get legal help as soon as possible after you have been struck by a commercial truck. 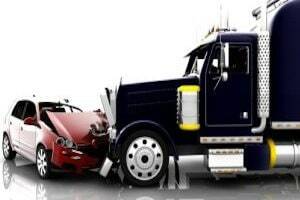 Contact an experienced Los Angeles truck accident lawyer and schedule your contact us.